The Federal Trade Commission (FTC) is getting more reports about people pretending to be from the Social Security Administration (SSA) calling to get Social Security numbers and even money. This is a scam that is growing exponentially each year. In 2017, 3,200 people reported SSA imposter scams, and lost nearly $210,000, according to the FTC. Government imposter scams made up nearly half of the 535,417 imposter scams reported to the FTC in 2018. In one version of the scam, the caller says your Social Security number has been suspended due to suspicious activity, or that it’s been linked to a crime involving drugs or sending money out of the country illegally. The caller says your Social Security number is blocked and that they need a fee to reactivate it or to get a new number. The scammer will ask you to confirm your Social Security number. Remember, Social Security numbers are never suspended and the SSA never requires you to pay for one. In other variations, the caller says that someone used your Social Security number to apply for credit cards and now your benefits are in jeopardy. They may warn that your bank account is about to be seized, that you need to withdraw your money, and that they can tell you just how to keep it safe. The scheme’s details may vary. Scammers may claim that the SSA needs additional information to increase your benefit payment or send a rebate. They might say your personal information was lost due to a computer glitch. They may threaten to terminate your benefits if information remains unconfirmed. 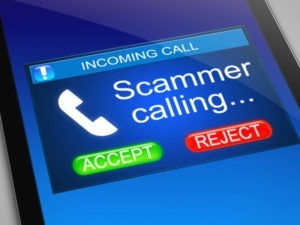 To hear what an SSA scam call sounds like, click here. Beware: Your caller ID may even show the real SSA phone number (1-800-772-1213), but it’s not the real SSA calling! Computers make it easy to show any number on caller ID. Don’t trust what you see. Remember, the SSA will never call and ask for your Social Security number. It will not ask you to pay anything. It will not threaten your benefits. Never give your Social Security number to anyone who contacts you in this way. Do not confirm the last four digits. Do not give a bank account or credit card number to anyone who contacting you by phone. Remember that anyone who tells you to wire money, pay with a gift card, or send cash is always a scammer no matter who they say they are. If you’re worried about a call from someone claiming to be from the SSA, get off the phone and call the real SSA at 1-800-772-1213. You could also call the Office of the Inspector General at 1-800-269-0271. If you spot a scam, tell the FTC.